To avoid the waste area and a couple of fairway bunkers 250 yards off the tee, the player's tee shot alignment should be to the left center of the fairway. A good tee shot leaves a short iron into a deep, two-tier green. 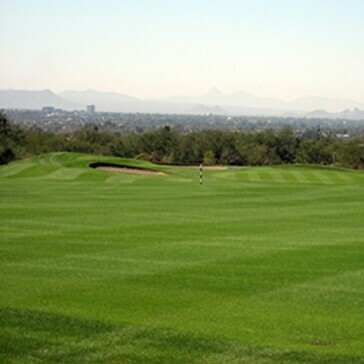 Putts on this green, as with most of the greens on the course, will break towards downtown Tucson. Only the longest ball strikers can make it over the water hazard. Smart play is a lay-up shot of 200 yards to a generous landing area on the left side of the hazard. A second shot of about 220 yards leaves a short iron into the green. 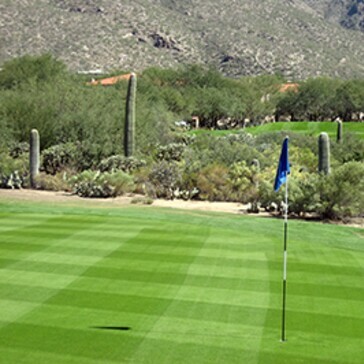 The green is wide, but only 15 paces deep, so approach shot distance must be very accurate. 90% of the fairway consists of swales and mounds leaving the player with an almost guaranteed uneven lie for their second shot. A driver or a 3-wood will leave you with a short iron left into the green, but the front third of the green is actually a false front, and any shot that comes up short of the middle tier will find itself backing off the front of the green. The green is a stout 32 paces deep, but only about 12 paces wide and framed left and right by two sand bunkers running the length of the green. There is a small margin for error short of the green, but any shot very much to the left, right or long will bring the saddest of all chants from your playing partners. 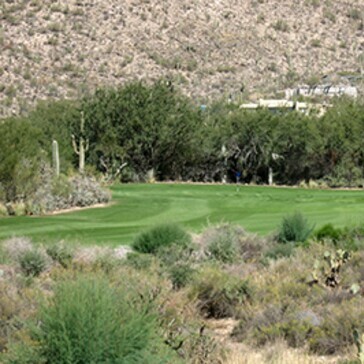 The tee shot is to a narrow fairway with dense desert ground cover on the left and heavy rough on the right. 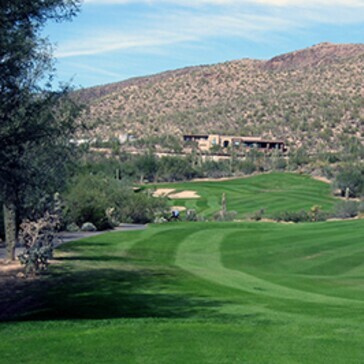 Even with a good tee shot, the player is faced with a downhill lie for their second shot. 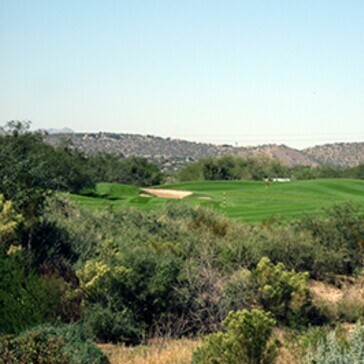 This downhill lie and the series of sand bunkers lining the left side of the fairway and green tend to make shots track to the right of the target line where a large lake snuggles up close to the green's edge. Par 3 131 yard tee shot hit with a slight draw will give the player the best chance of getting their ball close to the hole. 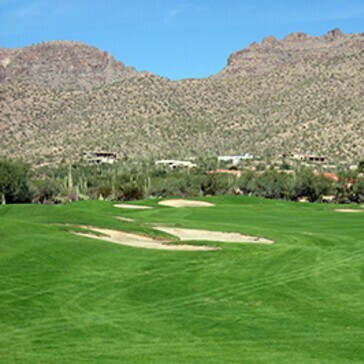 Hit it short left or long and right, however, your next shot will probably require a sand wedge and with a green depth of 37 yards, a tee shot onto the green is no guarantee of making par. 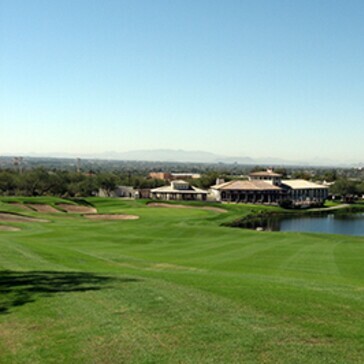 A right-to-left tee shot on this hole offers the best chance of good position on the fairway. 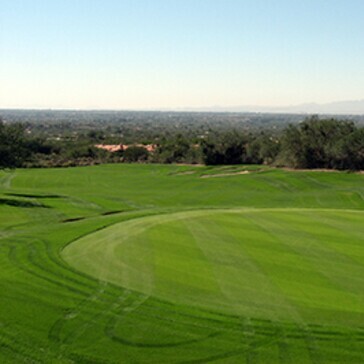 A waste area on the left runs the length of the fairway. 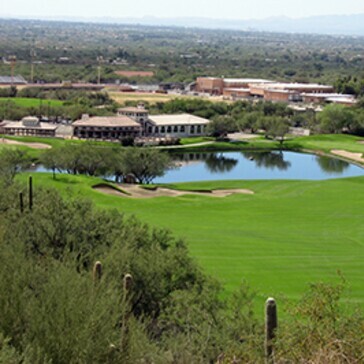 A perfect tee shot will begin toward the fairway bunkers and then draw to follow the dogleg. The fairway narrows as it approaches the green. 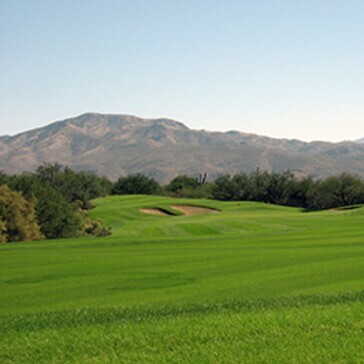 Unlike most of the greens, this one breaks toward the mountain. The landing area of this hole is surprisingly generous. The price for sloppy golf here will be paid at or near the green. A good tee shot here will leave only a short wedge left for the second shot, but it will be into a half-turtleback green that falls away in front and to the right. This hole begins the toughest stretch of holes on the course. An uphill par three of 223 yards, most everyone who plays it thinks that the yardage has been measured in meters instead of yards! Take an extra club for this tee shot. The green is not only very deep, but wide as well, and slopes sharply uphill in the back. This is easily the most difficult hole on the course. A long and accurate tee shot and second shot are required. 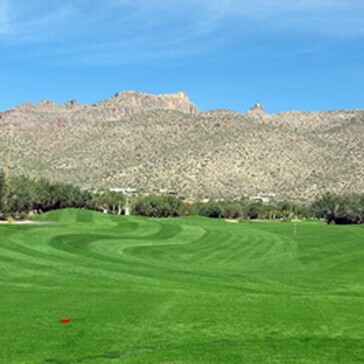 The fairway is narrowest exactly where the longer hitter's tee shot will end up, with a deep sand bunker cutting into the left side of the fairway, and the right falling off into dense desert "gulch". This is the deepest green on the course, 40 yards, making for a 4-club swing from front to back. This hole starts with a blind tee shot that must carry as much as 240 yards just to get to the front edge of the fairway. If you are lucky enough to carry your drive to the fairway, a long downhill second shot awaits you. If everything has gone well so far, the player is left with a short iron approach with a very wide, but shallow green, only 15 yards deep, and ringed in by severe sand bunkers. The layout favors a right-to-left tee shot into the green, which slopes substantially from back to front. 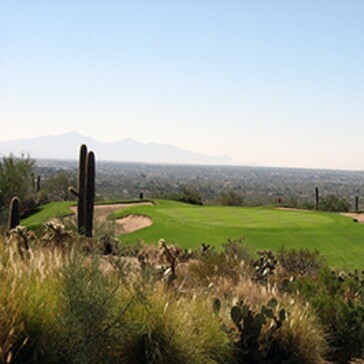 To the right of the tee box complex is a dry reservoir which was constructed by the Hohokam Native Americans over 1000 years ago. The three sand bunkers, one left and two right of the green, are all very large and very deep, do not go there. A tee shot with a carry of 245 yards or better can be launched over the fairway bunkers at the corner of the dogleg and will find a wide open landing area on the other side. Mere mortals, however, must play to the left of the bunkers, leaving a second shot of well over 200 yards to the green. There is room to run the ball up onto the green, but miss very much to the right or left and you'll be reaching for a sand wedge. This is one of the few holes to favor a left-to-right shot from the tee. 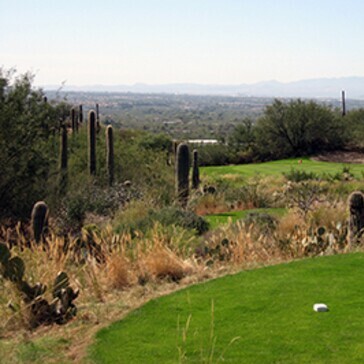 Of this hole's 404 yards, the first 200 are forced carry over natural desert terrain. The fairway falls sharply down to a waste area on the right. 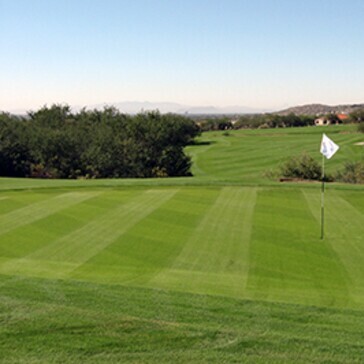 A good tee shot will leave the player with a middle iron into this medium sized green. This is one of the few greens with very little undulation. The breaks are subtle but sinister. 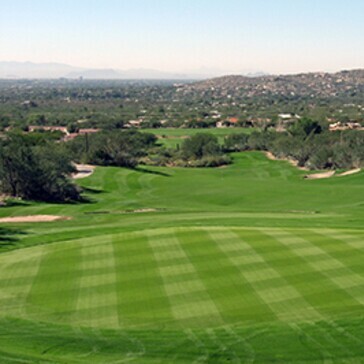 The 15th hole slopes uphill, so it plays longer than its measured 407 yards. The player's second shot should require no more than a medium iron, but it is to an elevated green, so it plays one club longer than the yardage dictates. 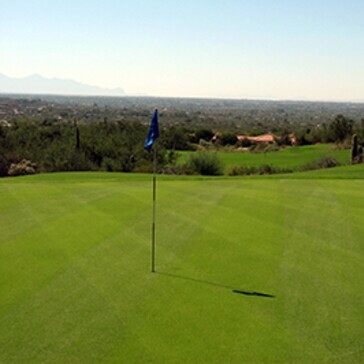 You do not want to be above the hole with your approach; putts down the slope are lightning fast. 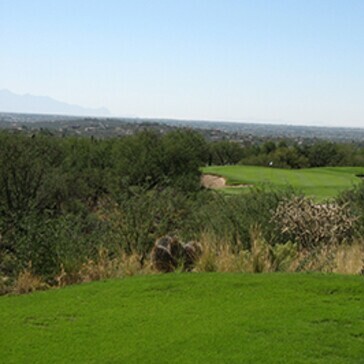 The tee shot is a blind one and must carry from 200 to 220 yards over a wash to reach the fairway. All but the longest hitters will find themselves with a downhill lie to an elevated green for their second shot. Two deep sand bunkers sit to the left of this very narrow green. The green slopes severely from back-right to front-left. Some putts can break up to six feet. The 17th hole is the longest par three on the course, but the player should take one less club than usual to compensate for the downhill layout of this hole. The green is quite large, but has 3 distinct tiers, and slopes severely from back-right to front-left. Shots missed left will find their way into a collection area. No putt is an easy putt on this green. The safe play from this tee is a left-to-right shot between the bunkers to the left and right of the fairway. 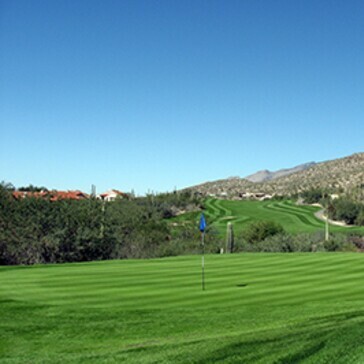 A good tee shot here will leave the player a long iron or fairway wood into the green. To be honest, a player stands a better chance of making birdie here with a lay-up for the second shot and a sand wedge for their third.